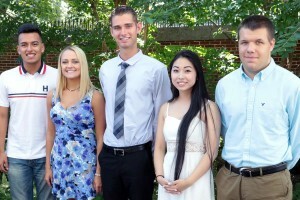 The Volunteer Center of Burlington County awarded five college scholarships on Wednesday, August 3, totaling $30,000 to five Burlington County high school seniors, including Eric Biehn of Medford, who have demonstrated a commitment to community service, leadership and academic achievement. Biehn, a senior at Shawnee High School plans to attend Duke University for math/science and plans to later obtain a post graduate degree in genetics and research. As for community service, he has initiated fundraisers for Christine’s Hope for Kids to assist children in need, and for Toys for Tots. He was also a leader in the Green Dot anti-bullying program, a regular volunteer in annual MS walks, and also a volunteer at church and community clean-ups and donation drives, at the Animal Welfare Center and at assisted living facilities. Eric Biehn of Medford was presented a $5,000 check during the check presentation ceremony held at Burlington County’s Historic Smithville Park in Eastampton. He was selected by a review committee which evaluated 66 applications — the most ever submitted in the five-year history of the scholarship. The Volunteer Center has now awarded $125,500 in scholarship money. The check was presented by Kris Laufer, a son of the late Joseph Laufer, a former recipient of the Volunteer Center’s Community Service Award, for whom the scholarship was named. Holly Haines, representing the Haines Family Foundation, also participated in the ceremony. The foundation is a generous contributor to the scholarship program. Joe Laufer, a former Burlington County College educator, was the County Historian and had amassed a multitude of community service activities before he died in 2014. The scholarship program is his legacy — but was named in his honor long before his passing. Laufer actually had taken the major role in administering the program. His wife, Penny, and four children, continue to support the initiative.